Also available in 4-packs and single quantities. Click here to view 80252. 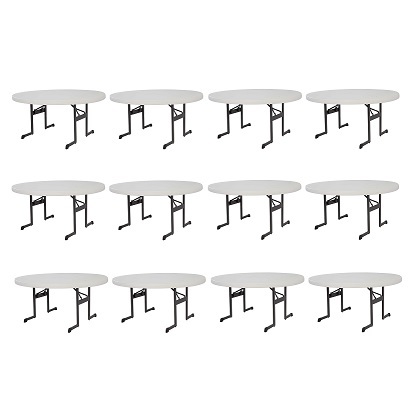 The 80313 12 pack of round tables was formerly model number 880252. The two tables are exactly the same, just with a new model number. 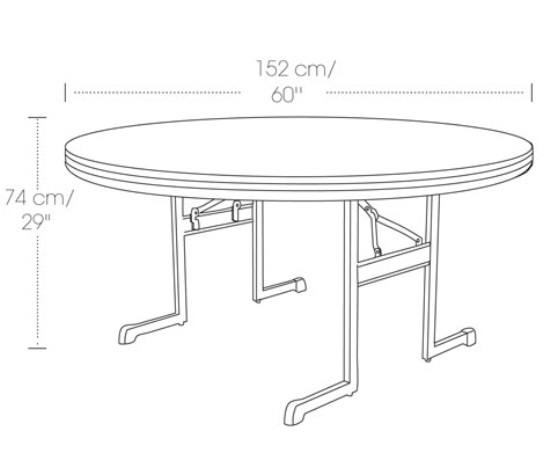 Get the latest, strongest round folding tables with model 80313 from Lifetime Products. These tables feature a ultra-sturdy metal folding frame capable of supporting up to 2,500 lbs. of evenly distributed weight on the table top. As with other professional grade tables, this package of tables comes with a limited lifetime warranty from Lifetime Products, assuring you a long time of use. These tables are ideal for wedding reception halls, churches, and schools where frequent, abusive use is typical. Save money per folding table by ordering them in the bulk, 12 pack. Table top material of construction: high-density polyethylene (HDPE) plastic. HDPE will not fade, crack, or peel like traditional plastics. Support frame material of construction: powder-coated steel. Powder coating helps the metal resist rusting. These tables can be used indoors and outdoors. Includes a limited lifetime warranty from Lifetime Products. 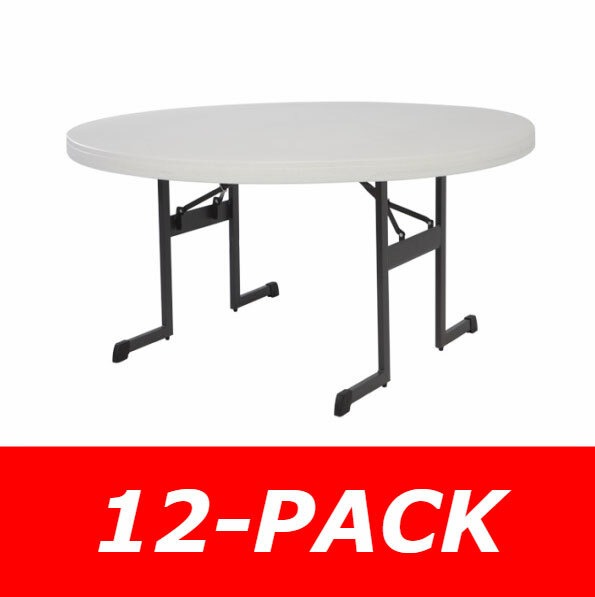 This package includes 12 tables. Table top diameter: 60 inches. Table top height: 29 inches. Folded dimensions: 60 inches Diameter x 2.25 inches H.
60 inch round tables can seat up to 8 people. 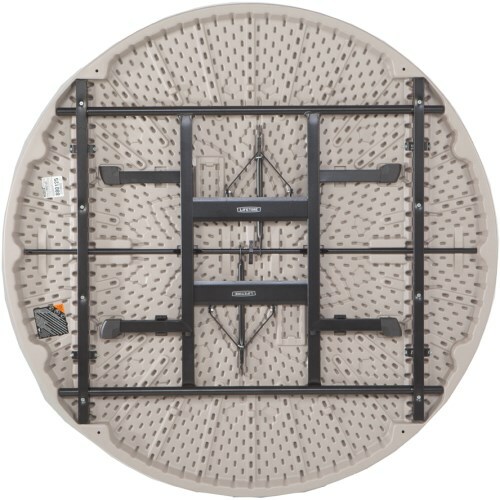 Table top weight capacity: up to 2500 lbs. of evenly distributed weight. Table weight: about 62 lbs. This package of tables ships via an LTL freight carrier for a curbside delivery. This type of delivery requires the customer to be present to sign for the delivery and to unload and move the product wherever needed. Delivery appointments can be scheduled with the freight company before delivery. 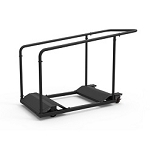 Tables can be pulled off the truck one at a time, so no delivery dock equipment is needed. Q: Is the 12 pack available in White? A: The professional grade does not come in white. The commercial grade does come in white if you want to see that model search on the website in the upper right corner using the term 80301. Feel free to contact us with any other questions. Q: Is this table exactly as it is pictured with the "H leg" design? A: Yes it is exactly as pictured with the H leg design. Q: What is the difference between the professional grade and the commercial grade? A: The professional grade table has legs that are further recessed for more comfortable seating all the way around the table. The professional grade has a lifetime warranty versus the commercial grade 10 year warranty. The professional table can also hold 2500 pounds versus the commercial 2000 pounds. Shipping: Orders for the 880313 Lifetime Professional 60" Almond Tables 12-Pack generally leave the warehouse the next business day. Dimensions: 62" x 62" x 34"